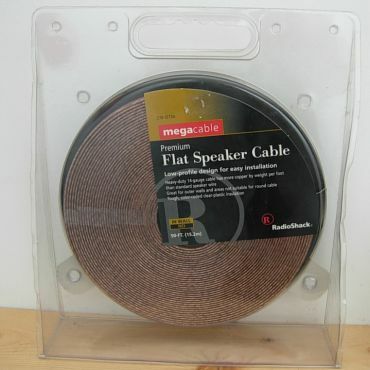 Introduction to Radio Shack Megacable Speaker Wire review: It is immediately obvious that this is an old review. I wrote it a few years ago out of curiosity but ended up not submitting it, likely due to being distracted by other review obligations. Like urban myths which circulate eternally on the Net, I occasionally see comments resurfacing regarding the supposed wonders of the Radio Shack Megacable or similar products. My conclusions in the article may seem harsh, but as a reviewer of top end gear I have worked with extreme products, and the Megacable is anything but extreme. In fact, my prediction has stood; the Megacables while not sold still sit untouched after two years – once was enough using them. I have used similar cables having individually braided small conductors, some in individual dielectric coverings and others bunched as are those in the Megacable. As well, I have used a myriad of other designs in cables and assure the reader there is nothing inherently superior sonically about the finely braided, grouped strands of the Megacable. I’m sure that somewhere there reside systems where the use of the Megacable will bring an opening of the heavens and the long sought after sound, but that “somewhere” was nowhere near my room. I paid my $26 or so including tax, so I can play the, “Let’s see if the cheapo wire beats the expensive stuff,” game. It is entertaining for me to test econo-products against the best. By the way, this is an unsolicited review. Neither Constantine, who’s likely having a heart attack when he sees this, or Radio Shack has requested it. I just felt like writing it! I had used this system lately with Wireworld Silver Eclipse speaker cables as well a different brand on review which I like the sound of quite a bit. I wrote up a similar system in an Audio Blast, commenting on the terrific sound. I made a brief but adequate comparison between the Magnacable and these two extremely good speaker cables. If the results were positive for it the Magnacable would see further use and comparisons. If not, it would be tossed aside. I used four equivalent lengths, at 12.5 ft. each, of the unterminated Radio Shack flat speaker wire. 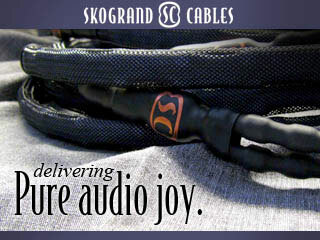 The other speaker cables were ten feet long, however they were terminated. I will let others argue over whether these were significant enough variables to be audible, or whether they cancel each other in terms of audibility. I did a simple comparison of several songs played through it, then switched out the speaker cables on review (MSRP of thousands of dollars) and replayed the music. Harsher than both WireWorld and the cables now on review. No finesse in the treble, more blurred; nuances of cymbals etc. are glossed over. Bass is poor, loss of definition and at times an indistinguishable mess, blurry. Not much heft or weight to the bass. Sounds monophonic compared to Wireworld and current review cables; sounds “dead,” lacking fullness in the bottom. Piano is gross, not natural at all. Lacks a sense of the piano case; sounds like there’s no body to the instrument. Midrange is overwhelmed by the treble and bass. Soundstage is diminished, fairly poor; venue is much less distinguishable from instruments. Essentially, this wiring killed the high in High End. One of the worst aspects was that the treble and bass occluded the midrange. The cable lacked finesse from top to bottom. It failed the Law of Efficacy, which means it did not immediately and consistently impress. It certainly did not prompt me to try it on other systems considering that this has been one of the most enjoyable rigs I’ve been listening to in the past several months. What should one expect from a cheapo wire? This cable is 14 Ga. and that is a huge part of the problem. In my experience more total gauge typically means more to love about the sound. I don’t think the miniscule multiple braided conductors did much for the result, woven, flat or not! I might have been impressed with this cable about 20 years ago when I was first experimenting with cables. At that time I probably would have thought it sounded good. I am not impressed with it at all now. It sounds about the same as other low gauge wiring I have tried on extremely good rig s- fairly poor and lacking in body and vitality. I would only recommend these as a stopgap measure for someone pursuing a serious rig but without the means for good cabling right away. I do not foresee ever using them again. Putting these wires into a high end rig will restrict the performance. If I had to listen to the system with the Radio Shack cables knowing how it could sound otherwise I would lose interest very quickly. It simply did not sound natural or captivating enough. I’ll admit I have become spoiled in this respect; I can’t easily accept sound which seems unrefined compared to what I normally experience. If you wish to believe that I’m simply trying to protect my interests as a reviewer of cables, so be it. If these were fairly good I would give them their due. They are very cheap, but certainly not high end cables compared with what I have reviewed. I have the most revealing, pristine source I’ve ever used in the Ayon CD-5, and still these cables sounded convoluted. That’s not good performance; with a lesser player they would have sounded a lot worse. My guess is that if someone is trying to get by on the cheap with speaker cables, they’ll likely try to do so with all the cabling in their rig. It’s not likely they would lay out big bucks for power cords and interconnects but skimp on the speaker cables. I would never recommend this. Put less than wonderful wires throughout your rig and you will surely choke the whole system. I have conducted enough of these “cheapo beats chic” tests over the years to firmly settle for me that cheap doesn’t beat much of anything quality-wise. This was another example of it. I was fairly certain the results would be as they were. However, I tried to keep an open mind and laid my money down to test it. (Don’t laugh; I laid down thousands of my own dollars in years past to test cables before I started reviewing). I was bored, and saw the topic on a discussion forum. I tend to do these things when I’m bored. One thing these tests do is demonstrate for me that quality is worth the price. I do wish I had my $26 back. I ‘ll sell them to someone for half price, “lightly used” and the test will have cost me net $13. Not bad for a bit of fun. 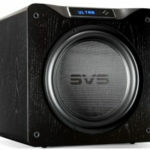 In the end, though I have been critical of the Radio Shack product, my reaction is similar to when I threw a quick review together for the economical Insignia Two-way 6.5” speakers from Best Buy. They also were very good for the pittance. In the end, however, even though much more prodigious sums must be spent to upgrade the sound to a higher level, the expense is worth it. The “magic”, the grace and vitality of the music simply is not in abundance with econo-gear. We do get spoiled when we ramp up our gear. Mark my words, you who think, “Aha! I’ll buy this cheap wire, sell my expensive stuff, and laugh all the way to the bank.” I’ve tried it, and over time I have regretted it. As the saying goes, “Buy the best and cry only once!” Eventually discontent settles in because the sound isn’t quite good enough – the very conditions I criticize about the Radio Shack speaker cable. At that point a person has a couple options; one can try to mentally beat down the discontent and listen to it despite the perceived lack of quality. One might also find themselves back in the search for cabling. I have an aesthetic sense of what beautiful music sounds like which is difficult to ignore. If what I’m hearing doesn’t match what I think it should sound like then every session is slightly irritating. Being frustrated over the sound doesn’t make audiophilia much fun either. However, when the music matches very well what my mental musical filter conceives as beautiful music then there is contentment and joy in listening. 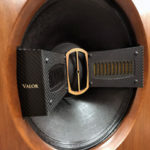 That is an experience which is worth quite a bit to me, far more than having more discretionary dollars in my pocket and being a frustrated audiophile. Of course, the tipping point between those two desires must be discovered by each individual. Would I recommend audiophiles try the Megacables? Based on my testing if the highest sound quality is your goal, my answer is “no.” Only if you are putting together an extremely economical rig, or are completely tapped out financially after purchasing your ultimate X component and awaiting a higher end cable, would I give a nod to them. If you are profoundly unhappy with your current cables you might spend the $26 and try them, but I believe the odds are fairly good the lowbrow sound will not captivate over the long term. I will share one last illustration which may shed light on the audacity of a reviewer to recommend vastly more expensive cabling. For a moment, let us consider all cables to be virtually the same, as they do, in fact, physically facilitate the enjoyment of audio through the system. Let’s also consider all snow shovels to be the same, as they do facilitate the task of snow removal. However, if one has a toy shovel with a 12” blade it will be far less comfortable and efficient to shovel a large driveway with it. Far better would be a larger, higher efficiency shovel which would result in quite a different experience. One could also use the analogy with a heavy metal shovel versus a lighter weight one; the experience of usage would vary considerably. So, in the end the fact that “a shovel is a shovel” does not alter the fact that the experience of usage may vary widely. Just as one would be mistaken to consider all snow shovels experientially similar, it is also a mistake to consider all cables equal in audio. One can get the job done with the Magnacables, but the experience was quite different from that with the higher end cables I have used, particularly in direct comparison to Wireworld and the other review cables. In audio efficient removal of snow is not the critical goal but rather musical enjoyment. If enjoyment and the sense of rapture in listening are not there when using an inexpensive product, then the target experience has not been reached and it doesn’t matter how cheap a product is because it does not satisfy. I have found that trying to convince myself that it does sound good because I really want it to sound good because it is low cost is self-delusion. The delusion doesn’t last and meanwhile there is frustration at not having what I really want. 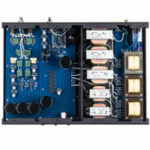 I am not inherently against lower priced products; you will recall that I have a fairly economical integrated amp which I used for this review and have lauded in a separate article. However, as one moves up the ladder of quality toward the lofty tower of Captivating Sound, sometimes a higher price is paid to reach it. But unless constrained by personal budget the economy of a product should not absolutely dictate whether it’s used in the system. This is a case where the cable does not deliver truly High End results – nor should it be expected to at the price. I appreciated the review. I’m looking for a good economical alternative. What do you recommend? I need a standard girth wire to run my front mains and also, a FLAT wire to run (along baseboard) to the rear surrounds. Thanks. From my limited and sometimes libation fueled experiments between ‘economical’ speaker wire and interconnects, I found Blue Jean Cable (http://www.bluejeanscable.com/) to be a good alternative if you don’t want to break into the 3,4 or 5-digit price tags. This is not intended as a flippant reply; with economical wires I would try several. I would try one or two of them purchased for a very low price on the Net. Then I would purchase the winner as a set from the dealer/manufacturer. This method should not cost you too much money in the end and will allow you to test several brands to find one you like. FYI, one flat wire which worked fairly well for me was Audioquest. I don’t recall the particulars of the model, but I believe they still make a flat wire for wall installation. Audiouqest is also a good choice to experiment with as they have been making cables a long time and there are many older models circulating in the community. 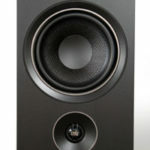 There appears to be a correlation in sound quality and price for almost all the cable reviews on this site. Not surprisingly this brand of cables got bad reviews for being one of the cheapest cables ever reviewed here. Will you be able to ABX/ blind test this cable against far more expensive cables? If the cables are as bad as you claim they are then you should have no problem discerning them from your favorite cable absent visual stimuli. Untill then, your ‘reviews’ are nothing but anecdotes. Absurd post. “This cable is 14 Ga. and that is a huge part of the problem.” Yep – that’s right. You’re reviewing a 14 gauge wire and comparing with lower gauge wires? I just made four 11′ cables out of 3 spools of this stuff. Unbelievable sound with total gauge less than 10. I’m comparing with $400 Tara Labs and these have more transparency and more bass punch. They’re so much better I don’t even use the Taras anymore. Look – this cable is FLAT meaning more surface area per gauge. By braiding it as I did, the surface area is enormous meaning more room for electric field to be happy and less symmetry leading to lower magnetic field density overall. Extremely low capacitance and inductance. GREAT wire for speaker cable. Email me and I’ll show you pics of my braiding. Can even build you a set at the right price. Heck, I might even lend you mine so you can test em out. I suggest your criticism is a bit off-base; you are not discussing the cable which is for sale at Radio Shack, but rather a DIY project. I don’t disagree that a lower AWG number typically means better sound, and I do not doubt that you would have better sound with it braided from three separate cables. I was simply demonstrating the fact that claims of such low budget wires being giant killers are inflated. You are correct in realizing that AWG plays a big role in cable performance. However, if you are resting secure in the thought that simply because you have a fat wire the sound is all that, I have found huge differences in sound quality even in comparison of cables with lower AWG numbers. It’s not so simple as getting low AWG. Again, for the lower budget audiophile what you recommend might be a great move, but it’s no certainty that the sound will approach that of upper end cables. I have done experimentation on my own with making “mega cables,” on the cheap with solid core conductors which I feel are superior holistically to braided conductors, and I found them to typically underperform the better audiophile cables. So, I’ll pass on your generous offer to build or loan them to me. Flat, braided cables eliminate cross-talk between the wires, and have the minimum possible inductance and capacitance, and so no signal delay. In high voltage grounding where delay is critical, 4″ wide copper strip is used as “wire” for this reason. Yet, you have correctly noted the inductance and capacitance of the wire can influence power transfer. The power transferred from amp to speaker is very much a function of how closely the impedance of the two is matched because the impedance alters the phase of the current, and mismatched phases cancel each other to some degree, which sounds “muddy”. Impedance is a complex function of capacitance and inductance. If flat cables sound muddy, the speaker impedance is likely too low, and can be increased with different cables, or by tuning the cables. Make a coil in the speaker wire adding turns as you test until the sound is good. If this is not enough, add an iron core in the middle of the coil. Amorphous ferrite is best, as used on the clamps on computer cables, but the screw-on weight from a small exercise weight will serve. This can be moved in and out of the coil to find the optimum, and the number of turns reduced if the inductance is too high when fully inserted.